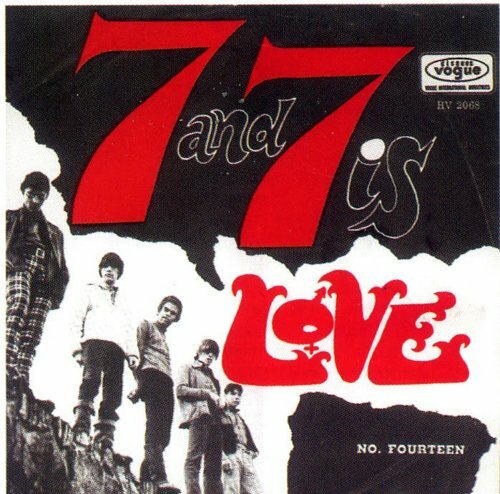 I was 9 in 1966 when this song came out. Originally an outtake from earlier recordings it was released as a single ahead of appearing on their 2nd album, 'Da Capo'. How I came to be listening to such arcane thrash at such tender years may sound I am bigging up my supercool but sadly, not so, the truth being more mundane. My big sister, upon whom I blame my musical precocity, had a boyfriend with their 1967 masterwork, 'Forever Changes' in his meagre collection. I loved some of the tracks, 'Andmoreagain' principally, disliking others, especially the noisy ones and the trumpety 'Alone Again Or'. (OK, so sue me, I was 10, I have learnt from that error of judgement.) But the name, the concept and the legend stuck with me as I became a teen. At my school there was a a cult of the obscure: you have to imagine nerdy and spotty brits in the UK, which is why, of course, I add an S to MATH, with each of my peer group endeavouring to out-gun the rest by virtue of claiming a love for ever more unlikely west coast bands. Zappa and the Mothers, Beefheart, the Dead, hell, we were entirely the wrong demographic. Remembering my sisters boyf and Love, my street cred was going to be a cert! Provided you accept the street was a quiet suburban cul-de-sac. So I bought 'Love Revisited', belatedly discovering this song, and now old enough to love it! But that's enough of me. So, after all that, how was the song so entitled? I still have absolutely no idea. As a child of the 50s/60s, I grew up with Tom Lehrer albums (along with Mozart, Bach, The Temptations and Jimi Hendrix). And like JDavid, I made my way through American college life with the minimal requirements - lots of other interests along the way , only to find myself teaching math 20 years later! -I never took a math class or any serious science class (I satisfied my distribution requirement through a Psychology lab and credit for a good AP Chem score from high school, which annoyed my freshman advisor, a chemistry professor, who urged me to take Organic Chemistry, an offer I declined. I also took an intro Astrophysics class which was designed for non-scientists and was an excuse to sit in a dark room and look at pictures of stars). Math and Science are just not what I was interested in studying, and although, at least at the high school level, I could do reasonably well (I survived AP Calculus BC, but when my kids took calculus, I remembered exactly zero about it—and I still count on my fingers). To this day, I’m curious about science, but I knew that it wasn’t what I wanted to spend my time in college on. So I’m not going to even attempt to explain what E=mc2, which is also the title of a song by Big Audio Dynamite, means. However, if any of my surprisingly large number of friends and classmates who are, in fact, physicists want to weigh in in the comments, feel free. Which is not to say that I don’t know that it stands for--Energy equals mass times the speed of light squared. But knowing that is far from knowing what it “means.” Instead, I will talk about the song a bit, a job for which I’m somewhat more qualified. 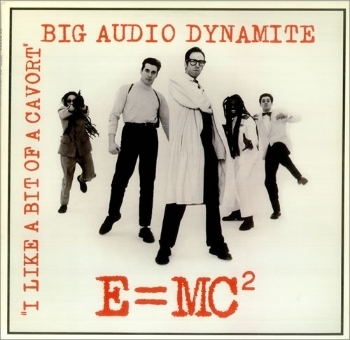 Big Audio Dynamite was formed by Mick Jones with film director Don Letts in 1984 after Jones was tossed from The Clash. The band’s first album, This Is Big Audio Dynamite, fused The Clash’s post-Sandinista!/Combat Rock punk with dance and rap, and liberally used samples from other songs and movies, something which was pretty audacious in that era. It’s actually a pretty great record. “E=mc2” is one of the real standout tracks. According to Wikipedia, it was the first song to be created all from samples, which either was a great achievement (particularly in the analog age), or was the first step toward the destruction of music. The song is inspired by the films of Nicolas Roeg, particularly Performance and Insignificance (in which Einstein is a character). Roeg’s films are best known for unusual directorial techniques and non-linear narratives that rearrange the time sequence, requiring the viewer to reassemble the pieces. Which, maybe, relates to the whole relativity thing (although maybe not—remember, I’m not a scientist and I’m not a film critic). Interspersed in the song, whose lyrics reference those, and other, Roeg films, are quotes from Performance, including one snippet featuring Mick Jagger, who starred in the movie. Controversial on its release in 1970, due to its graphic sexual content, drug use and violence, it became a cult classic, and an influence on music videos and films, notably by Quentin Tarantino and Guy Ritchie (which shouldn’t be a surprise, based on the description). In addition to being a clever, catchy tune, it was a success, hitting 11 on the UK singles chart and 37 on the US Billboard Hot Dance Club Play chart. Einstein, a violinist who loved Mozart and Bach, and whose musical tastes were described as “conservative,” probably would not have liked it.